Thanks to S/Sgt Walter H. Stull (Radarman) and to S/Sgt Joseph Rotondi (Radio) and his son Joe Rotondi. T/Sgt Delbert L. Gruver was wounded on May 29 and replaced by M/Sgt Charles W. Daugherty. 1/Lt Donald V. Hunter (Pilot), T/Sgt Leon L. Steward (CFC) and Sgt Louis L. Chicquette (T Gunner) also flew with the crew. Joseph N. Rotondi (Radio) is in the first row, third from the right. For extraordinary achievement while participating in aerial flight 11 July 1945. These individuals were combat crew members of a B-29 aircraft on a mine laying mission to Rashin, on the north eastern coast of Korea. This mission was flown from bases in the Marianas and return for an over all distance of approximately 4400 miles. Many difficulties and dangers overcome on this operation included complex navigational problems involved in such a long over water mission; making landfall at the planned time and place on the Korean coast; achieving a precise mine-laying run in the face of unfavorable weather conditions and difficult terrain; the great strain resulting from the long flying time involved; the possibility of encountering determined enemy opposition while twice traversing the main islands of Japan; and the danger of being forced far out to sea. Throughout this difficult and gruelling mission each member of this crew performed his assigned duties with such outstanding skill and devotion to duty that the entire operation was accomplished as planned and the mines released in the exact area where they would most effectively block shipping. The coolness, courage and determination shown in accomplishment of this long and hazardous mission by these veterans of repeated assaults against the Japanese homeland reflect great credit on themselves and the Army Air Forces. 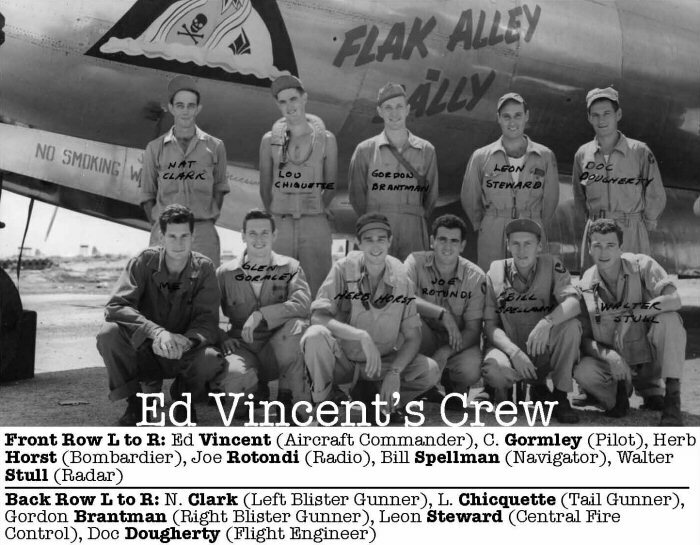 This crew generally flew "Flak Alley Sally".